We’d love your help. Let us know what’s wrong with this preview of A Curse of Stone and Fire by A.B. Bloom. Seventeen year old American orphan Mae Adams, has moved around her whole life. With no place to call home and no direction, she’s never felt like she belonged. But everything changes the day she steps into Fire Stone, a secluded school in the depths of the Scottish Highlands. It’s there that she dreams of a young woman—a powerful druid priestess—who has magic abilities which could shape the future of the world. While the vivid dreams of the past haunt her every moment, Mae has to face the dangerous and dark hatred of another Fire Stone student, Tristan Prince. He has no reason to hate her, and yet they share an overwhelming impulse to kill one another. When Mae finds a gathering of secret standing stones and the macabre remains they hold, the wild forest calls to her soul in a way she’s never known. 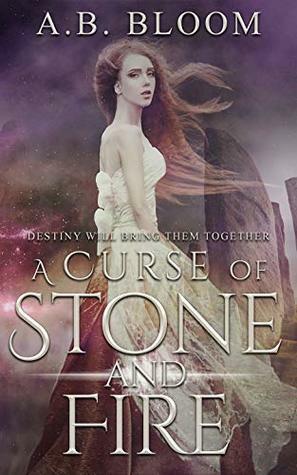 Believing in the impossible and stepping through the stones to the past, may be the only way for her to discover the truth and the enormous power she contains. The fate of the world may just depend on it if Tristan Prince doesn’t end her first. To ask other readers questions about A Curse of Stone and Fire, please sign up. This book is incredible. I am a huge fan of all of Anna Bloom's work but this story exceeded my already high expectations in every way. I adore Mae and Tristan. I was fascinated from the very beginning with their personalities and the relationship they had. The magic and mystery surrounding the pair of them never stopped and I remained intrigued throughout - wondering what is happening and what will happen next. I enjoyed this story so much that I didn't want to put my kindle down! A definite mus This book is incredible. I am a huge fan of all of Anna Bloom's work but this story exceeded my already high expectations in every way. Loved this! Right from the start, as American orphan Mae is being taken to the mysterious Fire Stone school in the Highlands of Scotland I was intrigued as to where this story would lead. The characters are all well written, and the instant and unfounded dislike between Tristan and Mae further intrigued me. There are dreams/visions of a distant past, and some ancient stones all adding up to a fabulous story. I'm looking forward to more in t Loved this! Right from the start, as American orphan Mae is being taken to the mysterious Fire Stone school in the Highlands of Scotland I was intrigued as to where this story would lead. This book is unlike any other books written by Anna but if I'm being honest its just as amazing! A story of true love that stayed with me long after I'd finished it, the only negative i have about it is that its left me wanting more! If you want to be swept away to another time and place then i suggest you get 1 clicking now!! I loved this book so much!!! It had my heart pumping and I couldn't put it down!! I was so invested in it at the end I was shouting "no" at the book.